Do you love potatoes? And are you on a weight loss mission? Then, you must switch to a sweet potato diet. Because they are not only a healthy substitute and easy to cook but also aid weight loss. How? 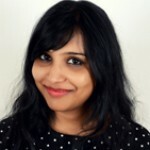 Well, give this post a read to put your curiosity to rest. Swipe up! The sweet potato diet, as the name suggests, requires you to incorporate sweet potatoes into your diet. You will also consume other fat burning foods like yogurt, veggies, and high-fiber foods. Follow this diet for three days. By the end of the third day, you will see a visible difference in your appearance as you may lose up to 4 pounds. So, how does this miracle happen? Find out next. It is really a puzzle why potatoes are considered fattening and sweet potatoes as slimming! But if you look the following reasons, you will hold the key to this puzzle. Here’s what you need to know. Sweet potatoes are low in calories – 100 grams contain about 86 calories and about 100 calories per serving. But 100 grams of peeled potato contain 110 calories or 400 calories per serving! Clearly, consuming sweet potato will keep your calorie consumption in check and your taste buds alive. So, when you follow the sweet potato diet, you will not feel restricted. Sweet potatoes are rich in dietary fiber. Dietary fiber aids weight loss by forming a gel-like mesh in the stomach, which makes you feel full and prevents you from overeating. It also encapsulates the fat molecules and prevents fat absorption, promotes stool movement in the colon, and aids the production of good gut bacteria. Hence, consuming the dietary fiber-rich sweet potatoes improves metabolism, digestion, and excretion, leading to weight loss. Now, this is a little dicey. First, let me tell you what glycemic index (GI) is. It is a number that indicates how the food affects the blood glucose levels after consuming it. When the GI is high, it means that the food causes a spike in the blood sugar levels, which can lead to obesity, diabetes, etc. But the dicey part about GI is that it changes depending on the way you cook a food. For example, boiled sweet potatoes have a low GI of 44, but when you bake or microwave them, the GI changes to 94. So, you must keep this point in mind when you cook sweet potatoes. The high water content in sweet potato is another reason for it being an effective weight loss aiding food. Dehydration slows down your metabolism. And consuming sweet potato helps rehydrate your cells and kick-starts metabolism. This, in turn, prevents your body from accumulating fat, balances the internal pH, and flushes out toxins. Plus, the water and fiber from the sweet potato will keep you satiated for a long duration. The orange or purple hue in sweet potatoes indicates the presence of carotenoids or anthocyanins. These phytochemicals are antioxidants. Sweet potatoes contain many other antioxidants like copper/zinc superoxide dismutase, catalase, and sporamins. These antioxidants help protect the body by preventing DNA mutation by the harmful oxygen radicals. The less the number of oxygen radicals in the body, the lower your stress or inflammation levels will be, which, in turn, aids weight loss. These are the reasons sweet potatoes are recommended for weight loss. But what about their carb content? Let’s find out in the section below. What About The Carbohydrate Content In Sweet Potatoes? Here’s the fact – 1 ounce of sweet potato contains 5 g carbs. The carb content of any food can be intimidating when it comes to losing weight. And since sweet potatoes are a close relative of white potatoes (plus they are sweet), you can assume that their carb content is high. But these are good carbs or complex carbs that cannot be easily digested by humans. And this indicates that sweet potatoes will not spike your blood glucose levels. Plus, they are low GL (glycemic load) foods – the GL of sweet potatoes is 11. The GL is calculated by multiplying the glycemic index (GI) of a food with the number of carbs in 1 gram of that food. So, it is safe to say that you can consume sweet potatoes without having to worry about their carb content (because that is low). Also, their GI and GL make them diabetes-friendly as well, depending on how you cook them (1). So, is there any scientific evidence that sweet potatoes are good for weight loss? Find out next. Chinese scientists fed laboratory mice a high-fat diet and supplemented with 15% and 30% sweet potato for 12 weeks. After 12 weeks, the weight and lipid profile of the mice were checked. The mice that were supplemented with 30% sweet potato showed significant improvement in lipid profile, reduced body weight and fat accumulation, and improved kidney function (2). Researchers conducted an experiment on laboratory rats and found out that sweet potatoes can help improve short-term satiety (3). Short-term satiety is important for weight loss as it keeps your hunger pangs at bay after you have a meal. But it also makes you hungry enough after 2-3 hours, thereby keeping your metabolism active. Another group of Japanese scientists fed laboratory mice a high-fat diet and supplemented it with 0.5% or 5% sweet potato peptide for 28 days. 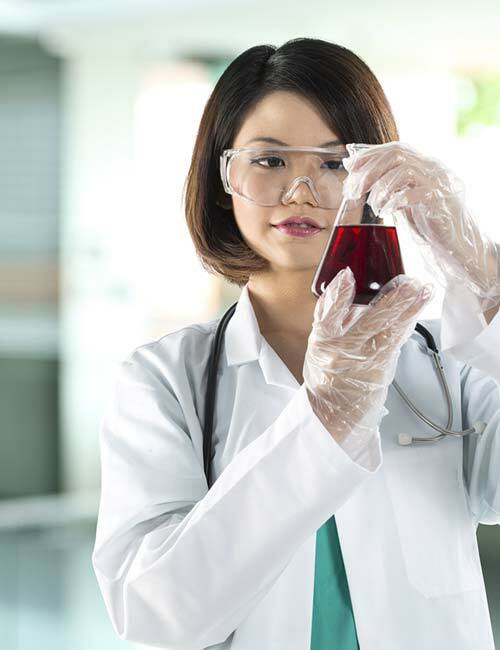 By the end of this experiment, they found that VLDL and LDL levels were low, lipid or fat synthesis (lipogenesis) was suppressed, and hunger was low (4). So, it is clear that sweet potatoes have a beneficial effect on your health and can aid weight loss. Follow the sweet potato diet plan for three days and see the results for yourself. Scroll down. The sweet potato diet should be followed for three days. It will help you detox, lose water weight, start mobilizing the fat, and feel amazing. Here’s what you’ve got to do. Following this 3 day sweet potato diet plan will definitely get your metabolism going and help you shed a few pounds. But what else can you do to mobilize the fat? Find out in the next section. Exercising is crucial when it comes to losing weight. 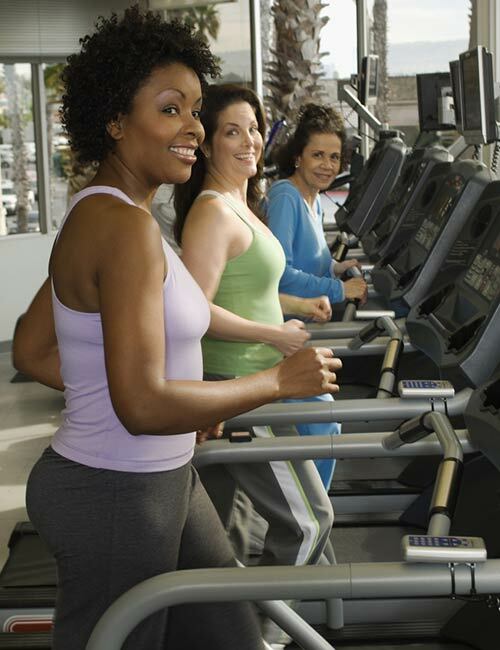 Working out not only helps mobilize the fat by creating a negative energy balance but also makes you feel stress-free. When you work out and follow an active lifestyle, it improves your brain function, muscle power, lung capacity, and heart health, thereby protecting you from various health risks. You must do a mix of cardio, strength training, yoga, and meditation to keep yourself interested in the workout routine. You may also opt for dancing, swimming, or running – whatever gets you going. When you are on this diet, most of it will contain sweet potatoes. But you can also add some other healthy foods to prevent your taste buds from falling asleep. Here’s is a list of foods you can consume. Veggies – Broccoli, beetroot, celery, parsnip, Brussels sprouts, cabbage, lettuce, carrot, cauliflower, spinach, kale, collard greens, radish greens, rocket spinach, and radish. Fruits – Apple, banana, kiwi, grapes, pineapple, peach, plum, papaya, watermelon, and muskmelon. Protein – Chicken breast, ground turkey, mushroom, tofu, fish, eggs, beans, and legumes. Dairy – Full-fat milk, full-fat yogurt, goat cheese, and buttermilk. Nuts And Seeds – Almonds, walnut, macadamia nuts, pine nuts, sunflower seeds, melon seeds, chia seeds, flax seeds, and pumpkin seeds. Beverages – Water, coconut water, freshly pressed fruit/vegetable juice, homemade smoothies, green tea, herbal tea, detox drinks, and black coffee. Herbs And Spices – Cilantro, dill, fennel, rosemary, thyme, sage, bay leaf, cinnamon, nutmeg, mace, turmeric, coriander, cumin, and mustard. There also a few foods that you must avoid. Here’s the list. Now, as mentioned before, the GI can change depending on the way you prepare the sweet potato. In the next section, I will discuss the best ways to prepare it. Take a look. Make delicious mashed sweet potato the same way you make mashed white potato. Use low-fat cream instead of full-fat cream. You can also add some peas and other boiled veggies to make it taste even better. You can also use sweet potatoes in smoothies. Make a banana and sweet potato smoothie and add chia seeds to make it delicious and proteinaceous. Just cut the sweet potato into wedges, sprinkle some salt and pepper, drizzle olive oil, and bake them. And voila! Amazing sweet potato wedges to satiate your hunger – hot and ready! Now, let’s take a look at other sweet potato diet recipes for weight loss. Spray a skillet with cooking spray. Toss in the spiralized sweet potatoes and cook for 8 to 10 minutes until they become soft. In the meanwhile, grate the apple and toss the pieces into a medium-sized bowl. Add the cooked sweet potatoes, egg, and cinnamon. Combine well. 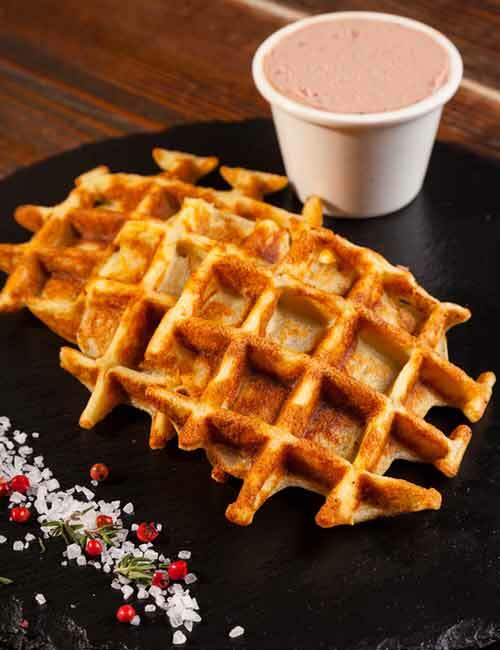 Spray the hot waffle iron with cooking spray and add half of the sweet potato mixture. Cook for about 8 to 10 minutes until the sweet potatoes are golden brown. 1 medium sweet potato cooked in the microwave or roasted in an oven until cooked through. Mix the flour, baking powder, baking soda, flax meal, and salt in a large bowl. 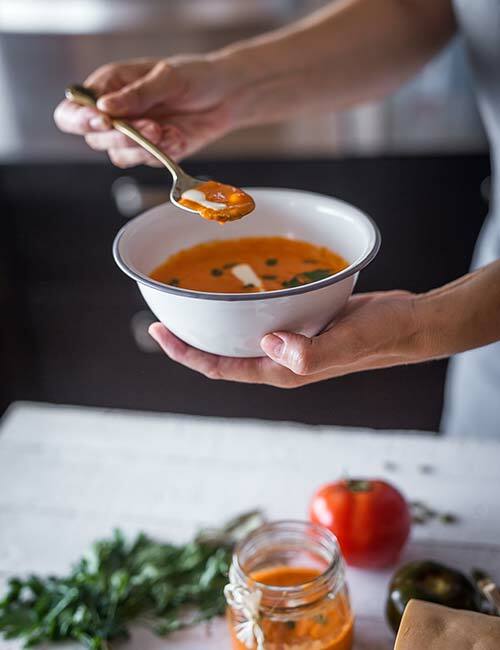 Use a food processor to mix the sweet potato, applesauce, orange juice, and non-dairy milk until you get a smooth mixture. Combine the dry and wet mixes together. Heat a griddle and spray cooking spray on it. Pour one-fourth cup of the batter in the center. Cook until the sides start to dry and bubbles appear on top. Flip the pancake over and cook the other side until it turns golden brown. 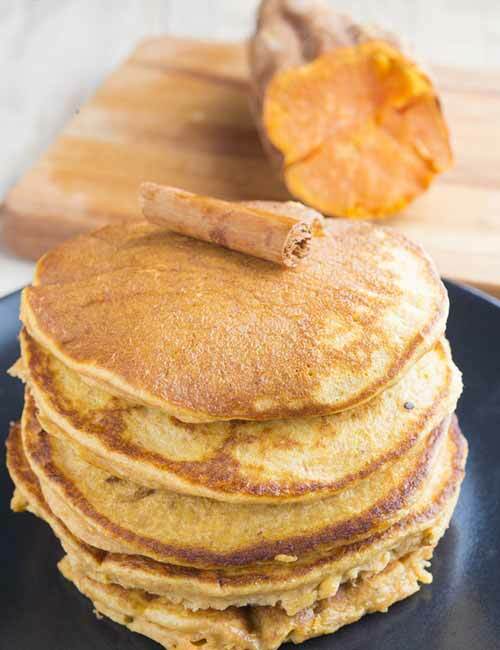 Blend the mashed sweet potato, 1/4 cup soy or almond milk, cinnamon, and nutmeg in a blender. Pour the mixture into a container and refrigerate. In another container, mix rolled oats, 3/4 cup soy or almond milk, chia seeds, stevia, and vanilla extract. Refrigerate overnight. 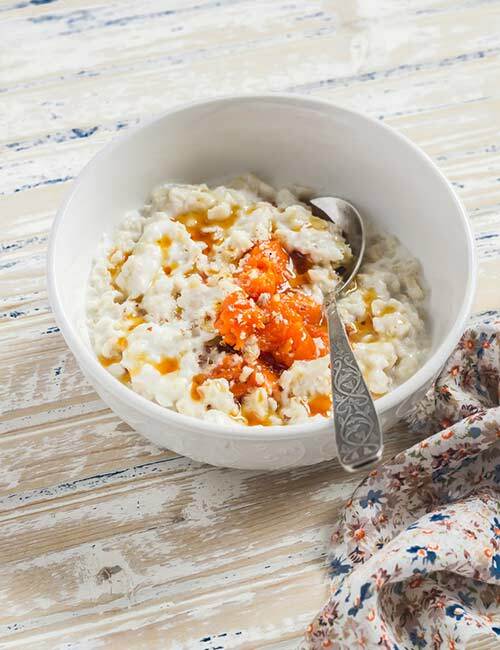 In the morning, layer the sweet potato and oats mixture in a container. Top with the chopped pecans and maple syrup. These are a few recipes you can try. But what other benefits do sweet potatoes offer? Find out next. Sweet potatoes are a rich source of vitamin A in the form of beta-carotene. Vitamin A is important for bone growth and repair, eyesight, your skin, etc. Vitamin C is a natural immunity booster. 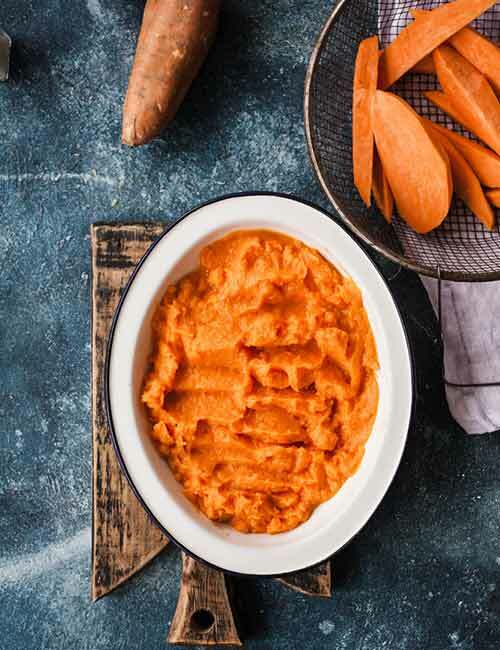 And 100 g of sweet potato contains about 2.4 mg vitamin C.
As mentioned before, sweet potatoes are loaded with antioxidants that help scavenge the harmful oxygen radicals and prevent DNA mutation. This helps keep the body functions running normally, thereby promoting your overall health. And when you compare orange and purple sweet potatoes, the latter variant contain three times more antioxidants. It is clear that sweet potatoes are really good for you. But are there any side effects? Find out below. Here are the possible side effects of consuming sweet potatoes. Kidney Stones – The high amount of oxalates in sweet potatoes can lead to kidney stone formation. Stomach Pain – A certain type of sugar called mannitol is present in sweet potatoes, which can cause stomach pain and bloating. Blood Glucose Spike – Though sweet potato has low GI and GL, baked sweet potatoes have a higher GI. This can lead to blood sugar spikes, and therefore, diabetics should avoid consuming baked sweet potatoes. To conclude, sweet potatoes are an excellent source of nutrition, and the sweet potato diet can help you lose the excess weight. Just make sure you prepare it the correct way, consume other healthy foods, and exercise regularly. 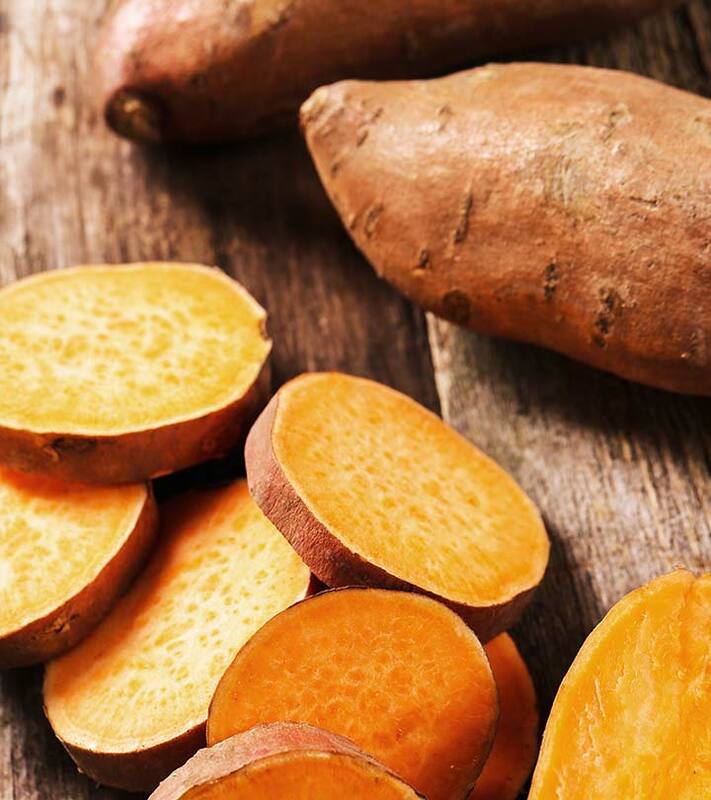 Try out the sweet potato diet and shed those pounds without feeling deprived. Cheers! Are sweet potatoes poisonous when raw? Yes. Do not consume them raw. 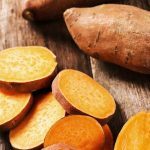 Can I eat sweet potato during early pregnancy? Sweet potatoes are rich in vitamin A, and during pregnancy, most women are advised to increase their vitamin A intake by 15-40%. So, yes, you can consume sweet potatoes during pregnancy. But consult your doctor before you do so. Is a boiled potato good to eat at night for weight loss? Yes, you can consume boiled sweet potato at night. Is Bitter Gourd Juice Good For Weight Loss? How Is Orange Juice Effective For Weight Loss?